I’ve often thought that categorising certain books as “classics” does a major disservice to their writers. The word “classic” does not work well with many people: there’s a whiff of the school or college textbook about it, a pious sense of learning that for many people is a huge turnoff because those who read to engage their own interests whether the book in their hands is about quantum physics, a twisted romance, a comic, or a whodunit, do not like the word “should”. They read only what they want to read and take evasive action when presented with a book they ought to read just because other people thought it was a ‘classic’. I’m one of these classics avoiders. Though I’m an English Literature graduate, I can count perhaps 20 “classics” I’ve read because I wanted to, not including those I had to read to, well, graduate. Which is why the slim volume titled Stories from Saratchandra: Innocence and Reality, translated from the Bengali by Anindita Mukhopadhyay, which I shall shortly be telling you about, is the first book I’ve ever read by Saratchandra Chattopadhyay, a true classic author in the realm of Indian literature as everybody knows. I didn’t know what to expect when I opened the book: Would I immediately be plunged into despair and depression? “Classics” tend to gloomy in my experience. To give myself a clue, I began reading the introduction to the book, but switched to the first story in a hurry because the opening essay had an academic intensity that seemed to assume I know everything there is to know about Saratchandra Chattopadhyay but the writer is being kind enough to tell me more. This is precisely why I avoid classics, but fortunately, the stories I read thereafter soothed my soul. Because Saratchandra might be the author of classics in Indian literature but he was just a writer before his deification and it shows. The first few stories in the book were not what I expected at all. They were amusing tales of a boy nicknamed Laalu who just could not stop himself from playing pranks on others, including his elders and betters. This unfortunate tendency continued even as he grew older; there was nothing this boy, then kind and helpful young man, then respectable building contractor would not do to shock and alarm the people around him when swayed by his mood. The funniest story to me was Laalu – One, when Laalu took revenge on his mother, who had threatened him with a private tutor if he did not stop his pranks. What he did to his mother’s visiting guru still makes me fall about laughing a few days after I finished the story. These, I suppose, were the stories of true innocence in this book, but as I proceeded from story to story, the themes grew steadily darker and more intense. In Childhood Memories, a young man with such a strong sense of ego that he terrorises his grandfather simply because he can, finds a sudden sense of compassion within himself when he is sent to Calcutta (now Kolkata) to study, and is assigned a servant in his mess, a man who barely has enough to eat, and whose life is nothing but servitude. That compassion, unfortunately, doesn’t translate to actual help when the servant is sacked for breaking a lamp, and the young man knows he will never get over his guilt in the affair. Another servant in Haricharan actually dies of a fever when his young master fails to realise that his bed has not been made for the night because the servant was sick, and beats up the boy. In the end, this young man does not even have a sense of guilt. And as I read further and further, stories about caste, poverty, humiliation, and even religious persecution emerged, leaving me — yes, with my stereotype of “classic” books confirmed — floundering in despair and depression. 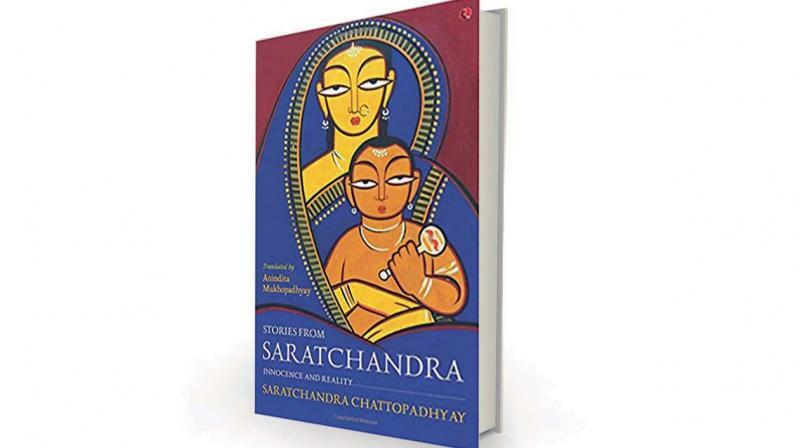 Saratchandra wrote in the early part of the 20th century, mainly focused on the lives of people in the villages. Since I’ve never lived in a village, and, thank heavens, never faced poverty, I can’t say if what he wrote was accurate and remains accurate. But from what I read in the newspapers every day, I have a strong feeling that very little would have changed in those villages between Saratchandra’s time and mine, which makes these stories all the more poignant. I have to say though that they are very old-fashioned in style and texture, perhaps the original Bengali stories may not seem quite so dated. I was irritated when Saratchandra’s brahmin background showed in the way he referred to people of other castes even through his characters’ voices, and I often knew, within a page of starting a story, exactly how it would end, thanks to having read similar stories in my Hindi textbooks more than 30 years ago at school. But I did like quite a bit about this book, in particular the way it’s been compiled, beginning with innocence (though some of those children need several slaps as far as I’m concerned), continuing to reality, and then, just as I was about to drown in depression, ending with a story that gives me some kind of hope even in the polarised age we live in now. Given how gloomy I feel about the world at this time, that’s saying something.